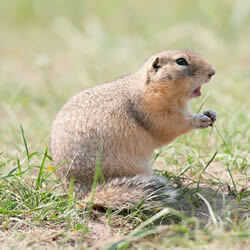 Gophers, specifically pocket gophers, are burrowing rodents that spend most of their life underground. They are widespread across much of North America and extend well into Central America. Gophers have small eyes and short hair that typically matches the color of the soil in which they live. They typically range in size from 5 to 12 inches in length. Gophers are natural hoarders and will pack their cheek pockets full of food which is how they get their name pocket gopher. They carry this food back to stash it in their underground burrows. Call Trapper J for your Gopher Removal Service. The presence of gophers is easily recognized through the presence of large dirt mounds that will appear on lawns, flowerbeds, and pastures. These burrowing rodents can cause severe damage to landscaping which can be costly for home owners and business owners. They are also known to feed on plants which can damage decorative landscaping, agricultural crops, and even trees can be damaged by gopher activity. Gophers will typically flee when threatened but have been recorded to bite dogs, cats, and even humans which can inflict a deep cut from the rodents long incisors. To prevent further damage to your landscaping, gopher trapping and gopher control should be handled by a licensed wildlife professional. If you are suffering from gopher damage, Trapper J can provide gopher trapping to eliminate initial gopher populations and provide ongoing gopher control programs to prevent future gopher issues on your property. Trapper J, a North Louisiana Gopher Removal specialist is the most professional and humane nuisance wildlife control service available in Monroe, West Monroe, Ruston, Bastrop, Alexandria, and Pineville in the North and Central Louisiana area.